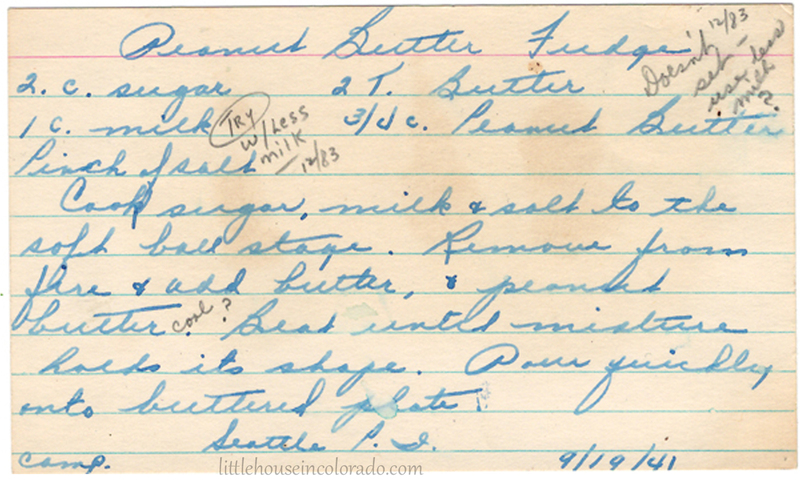 This recipe for Peanut Butter Fudge was handwritten in beautiful blue script on an index card. It was found mixed up in a modest collection of recipes dating back to the 1940s. 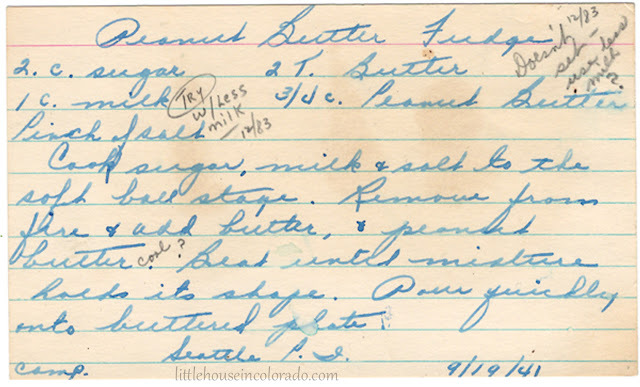 This particular recipe card had the date 9/9/41 written on the bottom. Also “Seattle P.I.”. We’re not sure, but perhaps this is a publication where the original recipe came from. We made this recipe (using salted butter and omitting the pinch of salt) and found that when heated to the correct temperature (soft ball stage), it does indeed set. Soft ball stage is 240°F but is different at high altitude. To adjust for your altitude, decrease the temperature 2° for every 1000 ft above sea level. I am just below 6000 ft which meant for my altitude, soft ball stage would be 12° less. I cooked the sugar and milk mixture to 228°F (240°F - 12°F = 228°F). Waiting for the soft ball stage. 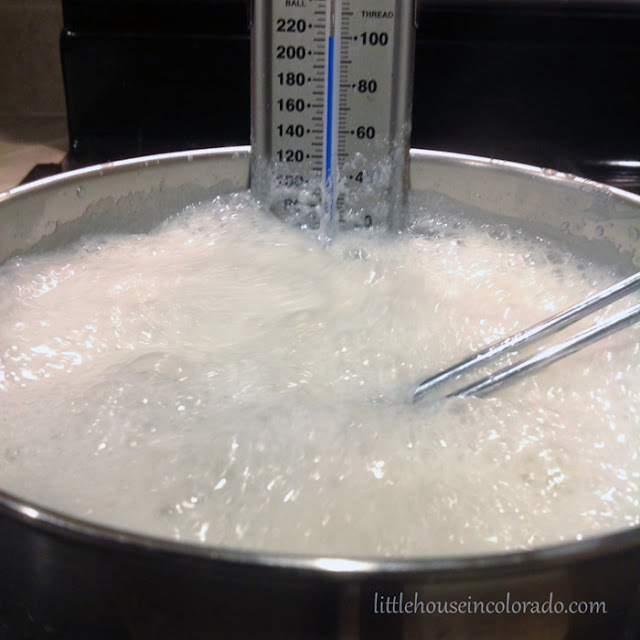 I'm using a Wilton Candy Thermometer that clamps to the side of the pot. I added in the butter and then the peanut butter. Almost as soon as I added the peanut butter and started stirring, the mixture practically seized on me! I didn't have a chance to take a picture because I was scrambling to do something with it. 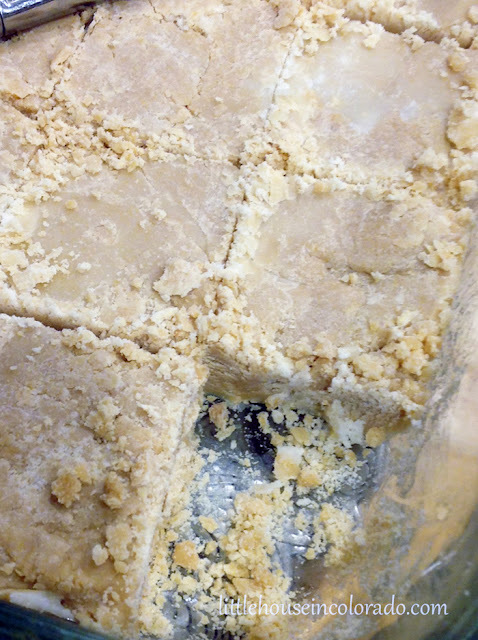 I was able to get the peanut butter incorporated into the milk/sugar mixture and then quickly pressed it into my buttered 8x8" Pyrex pan (glad I had the pan ready to go!). You can see in the picture above that it wasn't fully mixed together. Regardless, it tasted great! 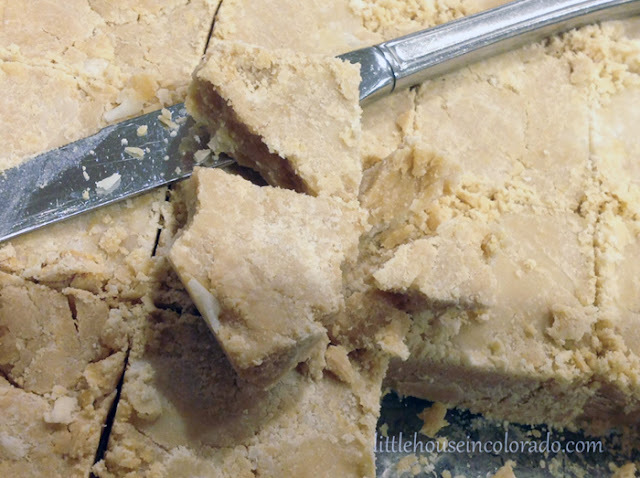 A bit more crumbly than what we expect from fudge, but really tasty. 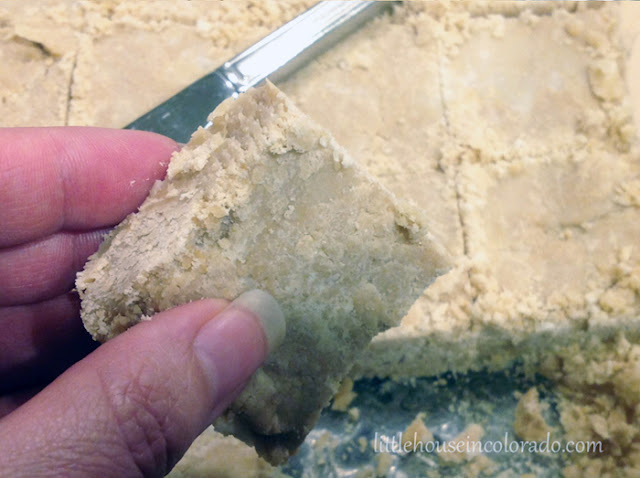 The flavor reminded me of peanut butter no-bake cookies. Cook sugar, milk and salt to the soft ball stage. Remove from fire and add butter and peanut butter. 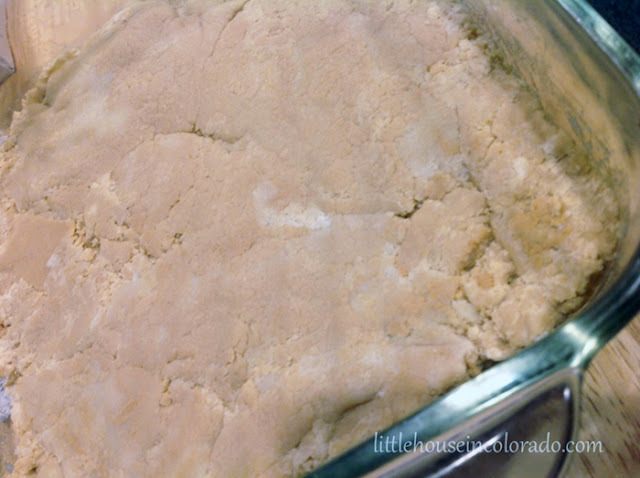 Beat until mixture holds its shape. Pour quickly into buttered plate. Notes say "12/83 Doesn't set - Use less milk?" We made this recipe January 2019 and found that when heated to the correct temperature (soft ball stage), it indeed sets using the ingredients given - almost too quickly.